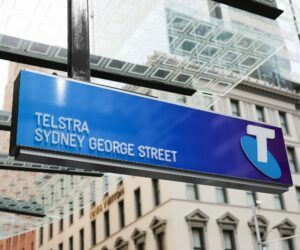 There’s no shortage of technology inside, as you’d expect from someone like Telstra. 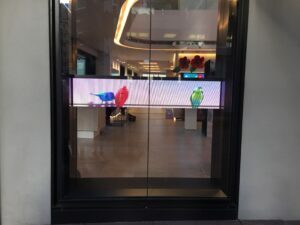 Even outside, there are ‘long’ displays around the outside of the store, with the aim of attracting passers-by off the street to come and have a look – rather than only those who knew they wanted to visit coming inside. The displays are actually (very subtly) interactive – above the displays there’s a camera, for tracking people as you walk by – meaning that your movements can help change what the displays show. 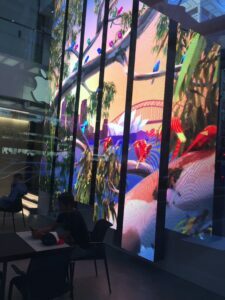 Together with the outside displays, there’s a giant three-story screen inside, dubbed ‘Centre Stage’, and they all show the ‘same’ content, tailored for that screen size. The content shown is localised – e.g., you’ll see the Sydney Opera House or the Harbour Bridge featured in some content, but obviously this might not be as relevant in Macarthur, NSW, or down in Melbourne, Victoria. 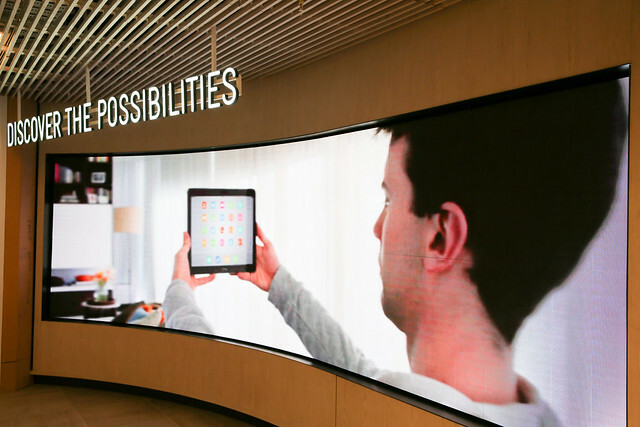 When you first step into the store, you’ll be greeted with the giant Centre Stage, but also whatever the latest technology is, on display. This may not necessarily be a mobile phone or broadband modem, with a big push into accessories for your ‘Connected Home’. For example, when I visited, Parrot’s ‘Flower Power‘ was being showcased. 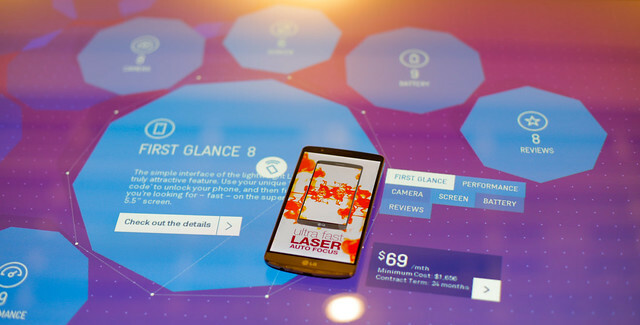 Above each of the displays inside, there’s more cameras above for eye and movement tracking. I’m sure it would provide plenty of interesting data for analysis later on – what do customers look at, or play with, do they pick it up, etc. Going around the store clockwise, the first two ‘walls’ are taken by the flagship developers; Apple on one side, and Samsung on the other wall. These are rotated and tweaked for each new product launch; the Note 4 and Note Edge were recently replaced with the Samsung Galaxy S6 and S6 Edge for example. Further around is the Connected Home section, or ‘Connected Life’, and there’s more concentration on other accessories, such as speakers/headphones, home automation or home entertainment (e.g., gaming consoles or Foxtel). Best of all, these are all ‘live’ and able to be played with to get a better idea about how their home could use these technologies in the future. 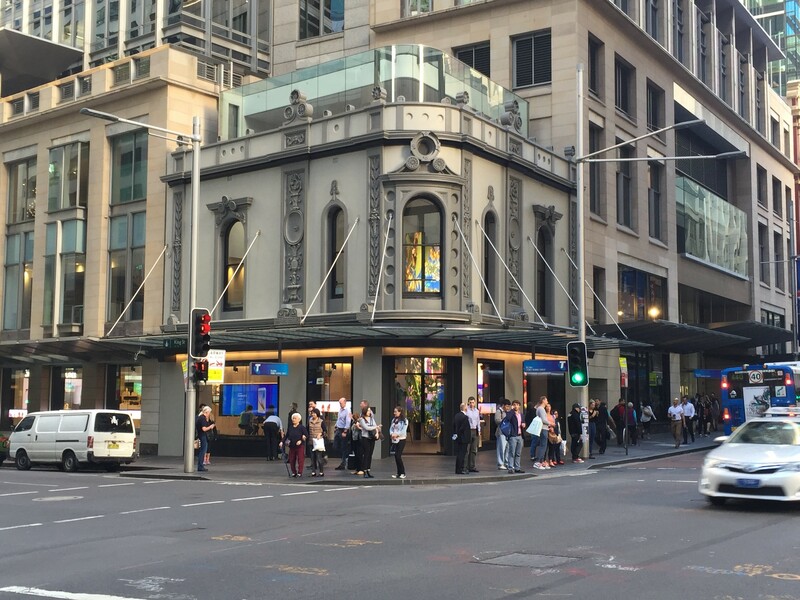 Interestingly, Telstra actually sell all of the accessories and equipment instore – you can actually buy Sonos gear, or a PlayStation from the Telstra store, and even put it straight on your Telstra bill or discuss other payment options. 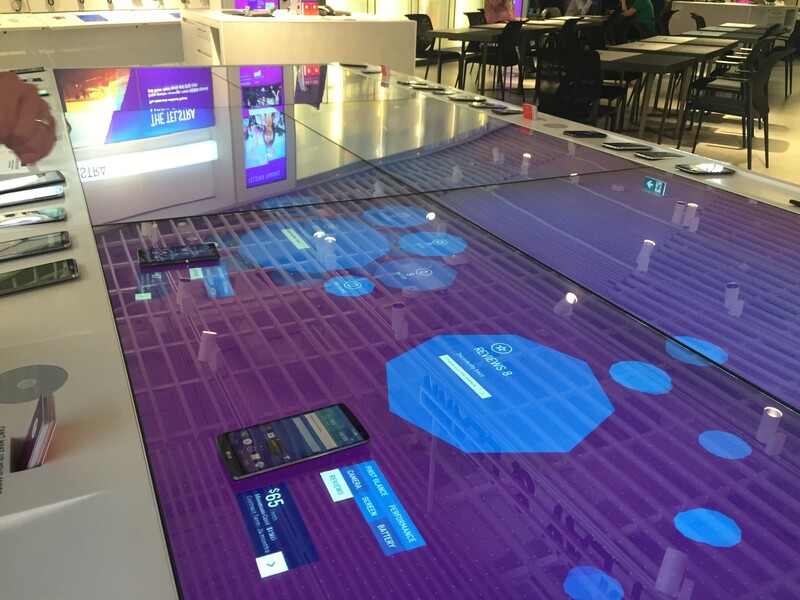 You can’t walk into the store without seeing the giant great big ‘table’, also known as the ‘Sandbox’ or Device Lab. 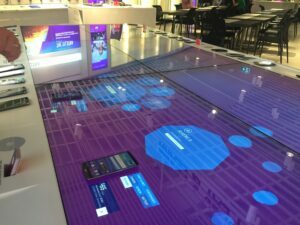 This is a great big interactive multitouch display, which responds to both touch and RFID tags – located around the table are a handful of ‘dummy’ mobile phone models with tags stuck on the back. By dropping the phone on the table, you can see details about that specific phone, such as price, camera, battery, speed and reviews. Much of the information is actually provided by independent third parties, such as GadgetGuy.com.au – not internally (with the possibility of biased reviews!). 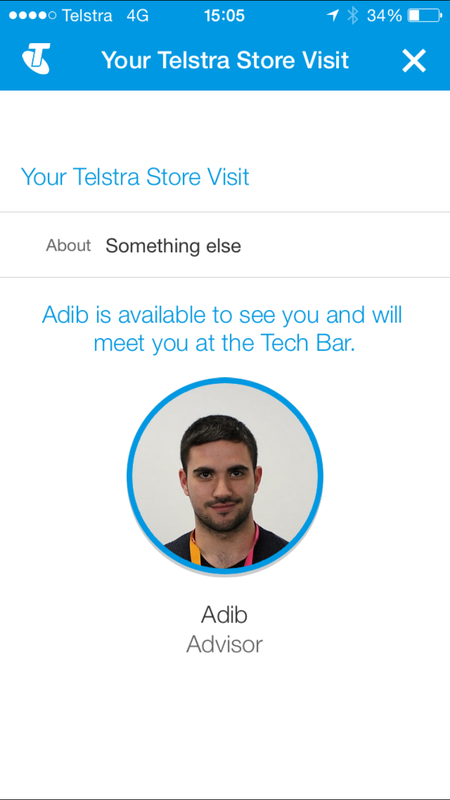 An example of where the addition of a beacon could help provide a more personalised experience, might be the possibility of walking up to the Device Lab, and because you have the Telstra app on the iPhone 5 that’s in your pocket, you would be able to quickly compare your existing iPhone 5 alongside a few of the other ‘newer’ handsets available. Littered throughout the store are also ‘Tap and Take’ cards. 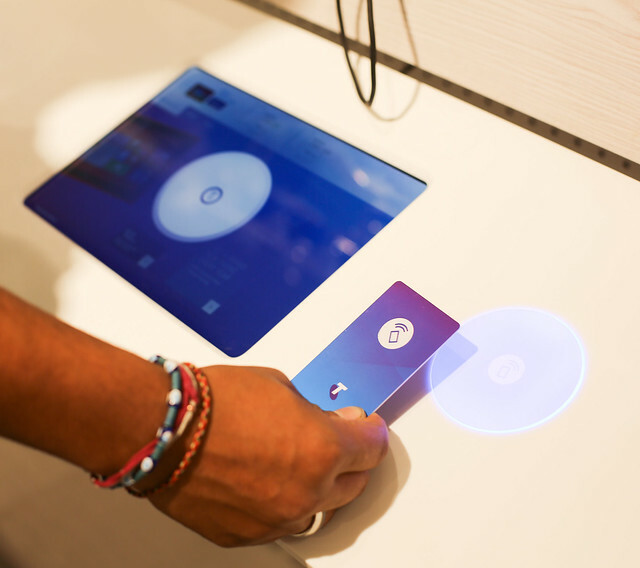 These allow customers to ‘collect’ information about *just* the products they themselves are interested in, and then take this to an employee instore, or actually jump online later and look at the phones or other products collected during the visit. 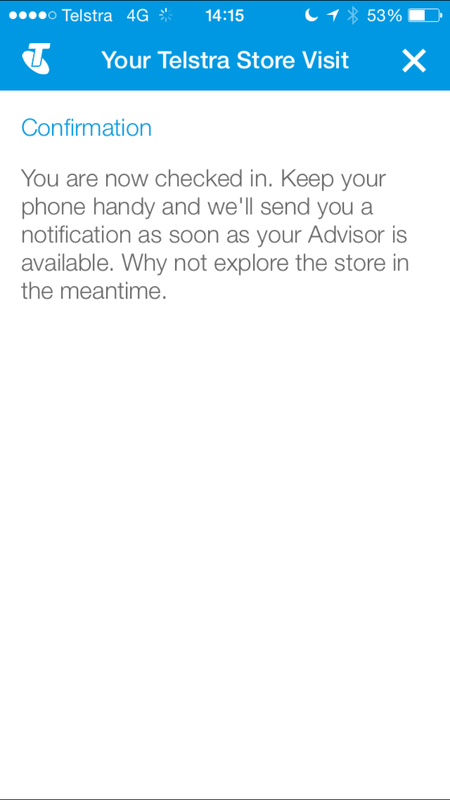 By placing the iPhone on the device lab, tapping the ‘Tap and Take’ icon, placing your card on the reader – that specific phone is now registered against that card’s unique number, which can be entered online later. Of course, all of the walls around the store are built to be flexible and modular – they can be moved and adjusted as need be. Whether that involves inserting a new display, reorganising shelving etc, it’s easily and quickly done. And so, best suited for all of the smaller accessories found across the store. Some other neat pieces of kit inside the store – all of the price tags are actually e-ink displays. Rather than having to print out dozens and dozens of price tags on paper, these can be updated wirelessly, and last for years without needing to have anything replaced (so, there’s environmentally friendly points to be won here too). There’s also a few ‘media fountains’, either side of the ‘cellar’, where all of the devices are kept out in plain sight, set behind frosted glass. 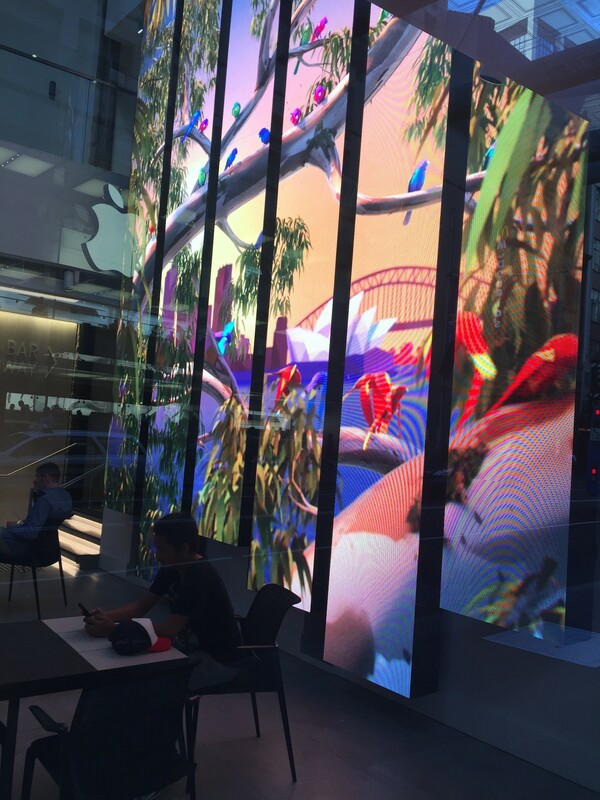 The fountains display some content from Telstra Media’s other properties, like music, movies and sport. 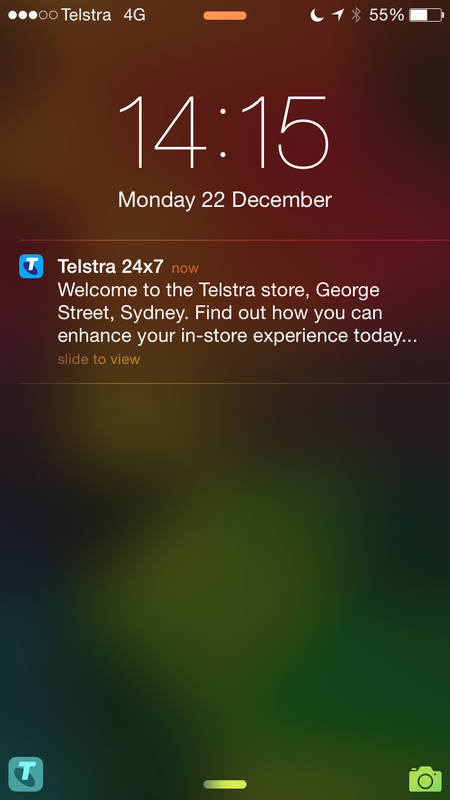 One of the unique features of the George Street store are the beacons (or, iBeacons for your iOS using folk). 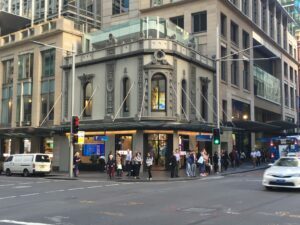 There are a handful of beacons stuck around the store, including one in the top left corner of the George & King St entrance. 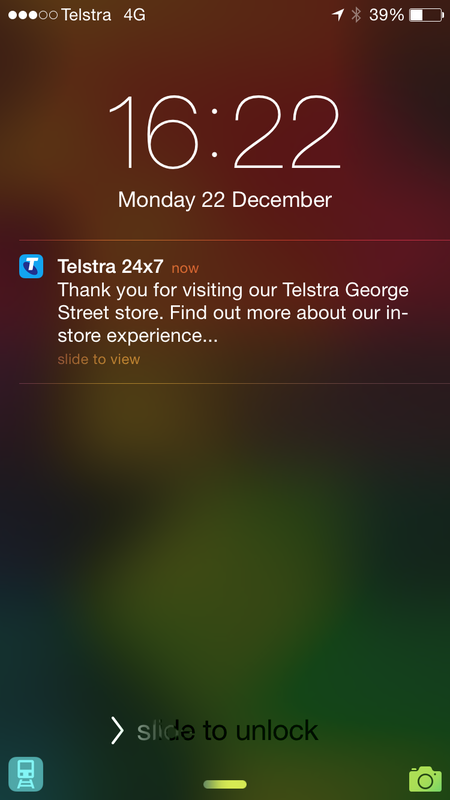 Currently, they offer little more than a ‘Welcome’ when you enter the store for easy access to the Telstra 24×7 app, and a “Thanks for visiting” after you’ve left. Initially, booking appointments from your was one of the beacon trials. The ‘welcome’ message would appear on your lock screen, and after swiping and opening the 24×7 app, you could organise for the best advisor to find your for specific enquiries. But what sounds great in theory doesn’t always work in practice – when checking in by phone, there’s not much to tie your check in, to your phone, and to you (and your face!). Nevertheless, this was quietly taken away, sadly. 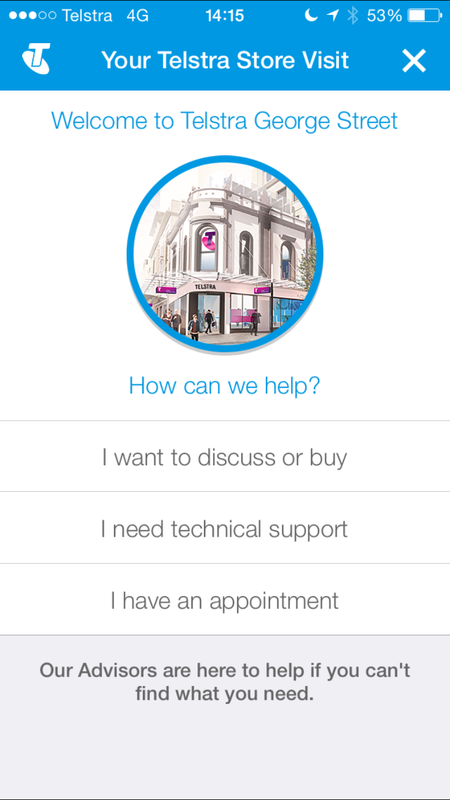 There are some other factors to consider for the beacon rollout, such as device support. 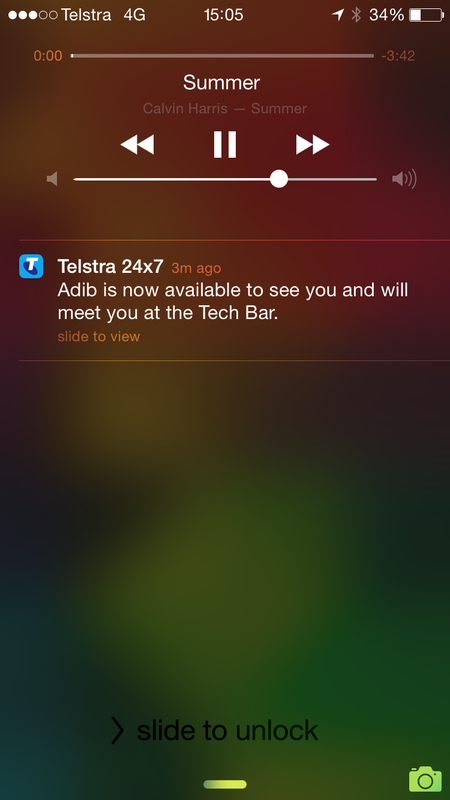 Only the iPhone 4s and above, running iOS 7, support ‘iBeacons’ natively. Unfortunately there isn’t yet a standard library or API for developers to use on Android, and so this fragmented experience doesn’t help when there are so many other manufacturers out there that may not be supported by a particular library. Bluetooth must also be ON for Beacons to ‘work’, and people may not have Bluetooth on, or may often only turn it on when required – but this may change with the rise of fitness trackers and smartwatches, with more customers keeping bluetooth on more often. 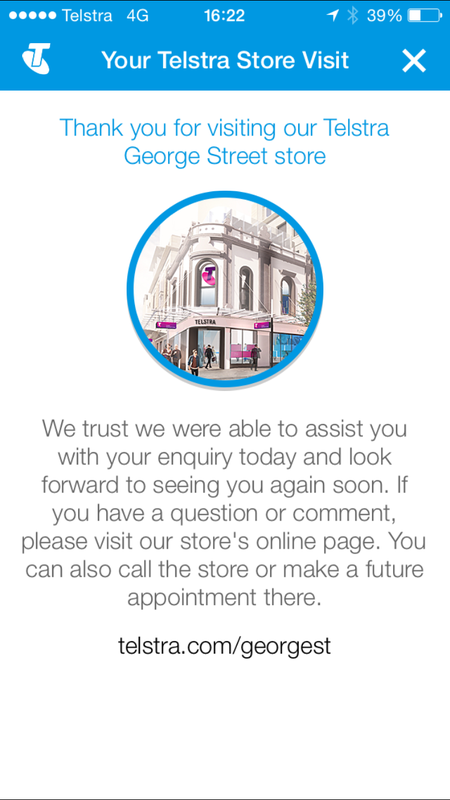 But it does show that there’s plenty of testing and trialling to be done for Beacons., and it’s great to see a ‘big’ retail chain starting to work out the best way to use beacons – and hopefully other stores will follow. As a customer, there’s of course some changes here too. 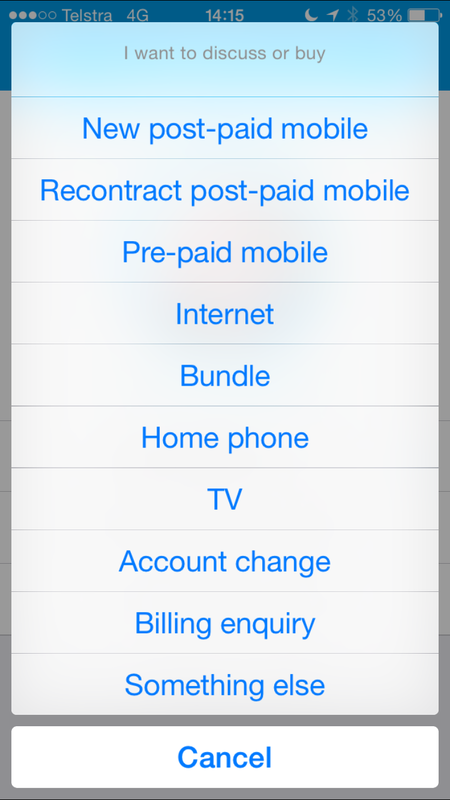 For example, (most of the) contracts are now totally paperless. You can walk in, sign a new contract with your finger on a tablet computer, and have a copy emailed to you together with all the other account information, and critical information summaries. There’s no need to carry out a stack of paper if you’re happy to have it sent to you digitally. The store is much more flexible about how you want to transact too – you can grab an accessory off the shelf, and check out with an employee roaming the floor, or you can still take it to the usual POS at the checkout table to finish off, and the store is constantly changing based on how people act – whether that be adding in more checkout areas, or moving some around – based on data from where people finish their transactions. 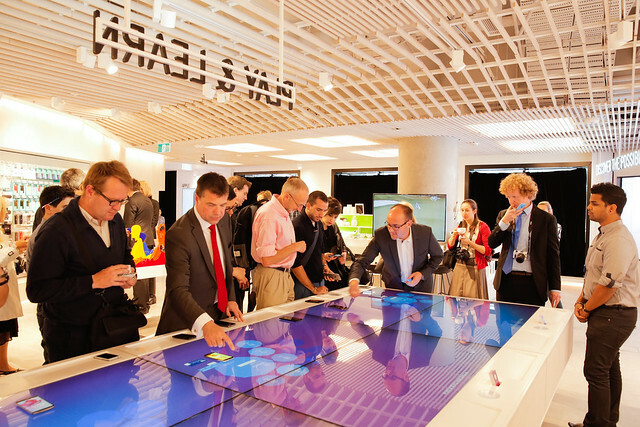 As someone who still loves to go ‘hands on’ with technology and talk to people before making decisions, it’s great to see some big changes happening when it comes to retail stores, whether it’s becoming easier to take prior research and decisions instore to discover further, or start the ‘journey’ instore before heading home or back to the office to finish your transaction there. It’s exciting to see the small changes and how they can make a big difference, mostly for the customer. 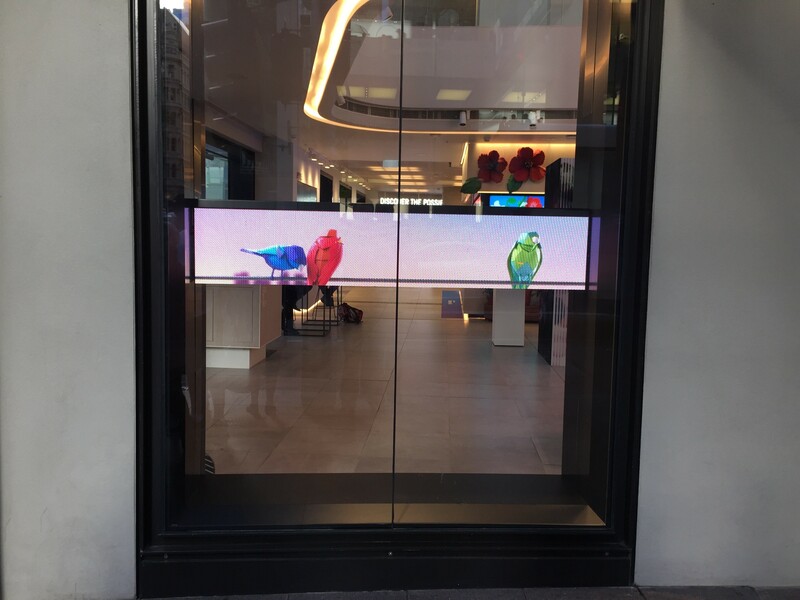 It will be interesting to see what pieces make their way to other Telstra stores, from bigger physical footprints like George St, down to much smaller stores inside malls and shopping centres.